Daily mean temperatures for the Arctic area north of the 80th northern parallel, plotted with daily climate values calculated from the period 1958-2002. The daily mean temperature of the Arctic area north of the 80th northern parallel is estimated from the average of the 00z and 12z analysis for all model grid points inside that area. The ERA40 reanalysis data set from ECMWF, has been applied to calculate daily mean temperatures for the period from 1958 to 2002. From 2002 to present the operational model (at all times) from The ECMWF is used for mean temperature calculations. 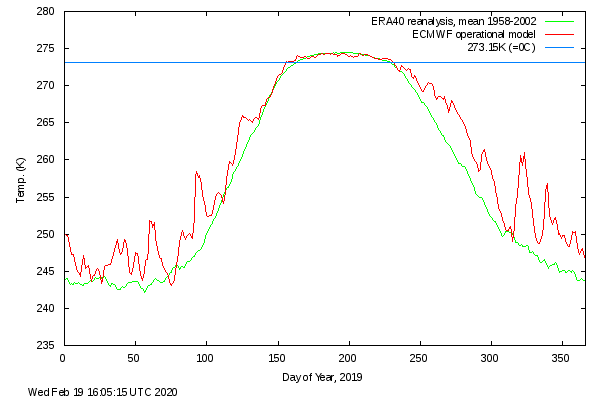 The ERA40 reanalysis data, has been applied to calculate daily climate values that are plotted along with the daily analysis values in all plots. The data used to determine climate values is the full ERA40 data set, from 1958 to 2002. Daily mean temperature and climate north of the 80th northern parallel, as a function of the day of year. See the annual mean +80N anomaly here.